We are proud to announce that GirlsCodingWithGirls will be honored by Code.org and CSTA in Seattle on December 3rd with a Champions of CS award as part of the CS Ed Week Celebration. Melinda Gates will be helping to present the awards. Here is an article about GCWG in NJ.com. Adesola Sanusi, who founded GCWG her senior year in high school and now works at Google, will be accepting the award on behalf of GCWG. 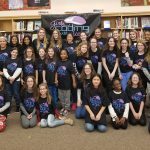 GCWG is a group at Warren Hills Regional HS in which high school girls teach 4th-8th grade girls to code, but more importantly, it is about the older girls mentoring and inspiring. They have hosted 10 six week sessions over the last 5 years with 260 younger girls and 39 high school mentors. All 22 mentors who graduated are studying Engineering or Computer Science in college. 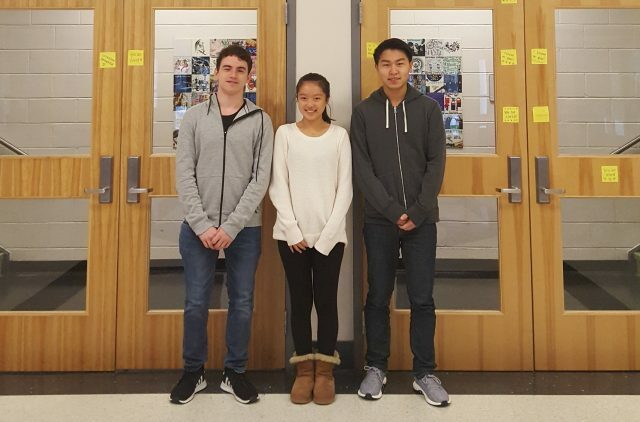 Three students from Egg Harbor Township High School were recently announced as winners of the Congressional App Challenge for our Congressional District. Alex Cohen (12th), Leo Shao (12th), and Vicky Zheng (11th) won with their app, Flashcard with Friends. Flashcards with Friends is a multiplayer flashcard quizzing game that works over iMessage. Within the Messages app on iPhones, users can open the apps panel to launch the app. From there, users search for flashcard sets that are pulled from Quizlet and select the set they desire to start a game. If there is no flashcard set that meets the user’s needs, they may head to Quizlet to make one themselves, and then search for it in our app. Their opponent will wait to receive a message to get the game started. This message will be received similar to a text message. All the recipient must do is tap the app to start playing! The game will cycle through the entire flashcard set and players will have to answer all the terms. Two points are rewarded for answering with a written response, and one point for answering with multiple choice responses, which are brought up when the user taps “I don’t know.” The player with the highest number of points wins. There is a YouTube video that illustrates some of the work behind the app as well as how the app functions. The students have taken this project a step further and uploaded it to the App Store! 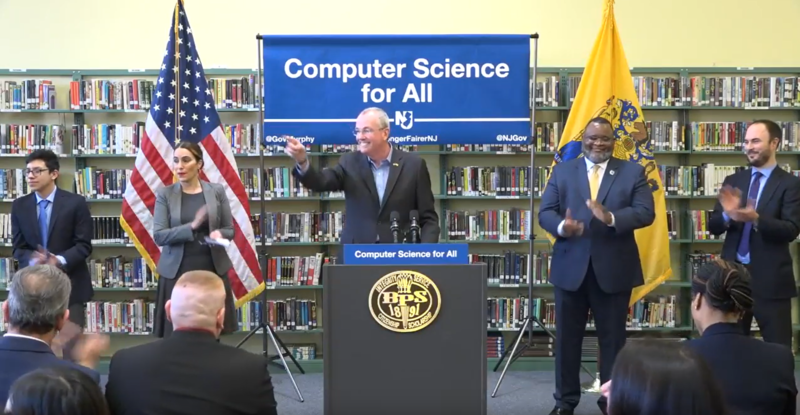 The beginning of October came with some very exciting news when Governor Murphy announced his Computer Science for All initiatives. This means that $2 million dollars in CS grant money will be awarded to 45 schools, the STEM office at the NJDOE now includes Computer Science, the Computer Science Advisory Committee will make recommendations on standards and the state CS action plan, and finally, Governor Murphy is joining GovernorsForCS. We hope you’re just as excited about this as we are! These important events all contribute towards ensuring that the students of our state will be well prepared for jobs of the future. This is the first time New Jersey funding has specifically targeted Computer Science education! 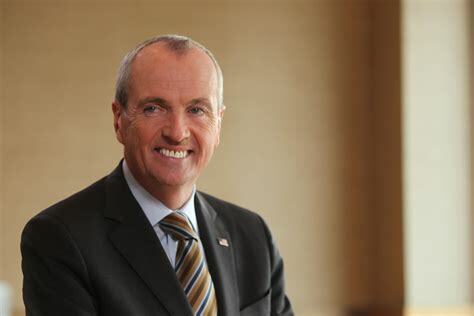 Keep up the good work Governor Murphy! Imagine a world without the police force. Who would you call if your house was broken into? Now imagine your laptop has been hacked. Who would you call? You wouldn’t call Apple, or Verizon; after all, you would not call your realtor after a break in. Cybersecurity is a huge talking point right now – the market for it is massive; employers are constantly looking for more people to hire. With all its current popularity, a career in cybersecurity is a great option for kids who are not necessarily in the highest economic sectors. According to Steve Morgan’s Cybersecurity Business Report on csoonline.com, the amount of cyber crime is estimated to triple the amount of unfulfilled cybersecurity jobs, which is predicted to reach 3.5 million by 2021. Similar to other big technology topics, the field is mostly male, with only 11% of the workforce being female. Schools around the country are adapting to the current emphasis on learning computer science by building or enhancing computer science programs in their districts. But what about cybersecurity? 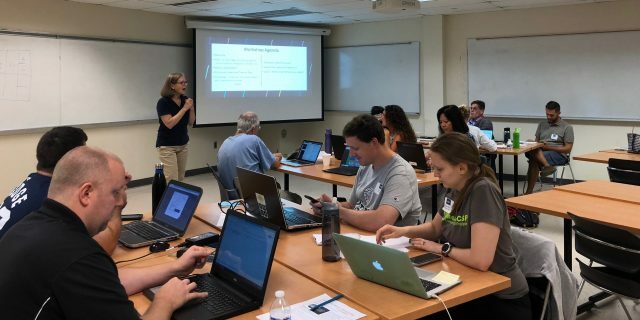 On Tuesday August 14th, Building Computer Science Education Capacity in NJ (BuildingCSNJ) hosted a cybersecurity professional development class. The workshop was led by Mandy Galante, who instructed teachers on how to use CyberStart, a program for students that allows them to learn about cybersecurity while they are playing games and completing challenges. It was overall a fun and productive day, resulting in many of the teachers leaving feeling confident that they could pass some of their cybersecurity knowledge onto their students. It is pretty simple: we desperately need more numbers in the field, and teaching students about cyber security will only help fulfill that need. While the future may not require a cyber police force, the more people trained in the subject, the better prepared we will be to prevent future cyber attacks. Teachers are encouraged to delve into cybersecurity in the classroom. “You have to get over being intimidated. Nobody knows it before teaching it,” said Mandy. BuildingCSNJ’s initiative is just one step in the grand staircase leading to a wide range of cybersecurity education and opportunities for students all around the country. It is time to make the cyber world a safer place. Click here to read the statement on Governor Murphy’s recent signing of the CS Education Teaching Endorsement.